Witnesses contacted CHS to tell us about the “large white bus” with “blue dots” and the flashing sign displaying a cycling message of “CALL / 911 / HELP”. According to police radio dispatches, several people also called 911 to report the coach . Fortunately for everybody involved, arriving officers found that Keanu Reeves was not at the wheel. An SPD radio report indicated that the driver said he had accidentally triggered the messaging system. CHS contacted the two agencies responsible for public bus coaches on Seattle streets and both were mostly certain this bus did not belong to them. While Metro never got back to us about their emergency procedures, Sound Transit tells us its coaches are also equipped with a similar system. In an emergency, the operator can trigger the silent alarm system that notifies the main control center and posts an emergency message on the coach’s display. 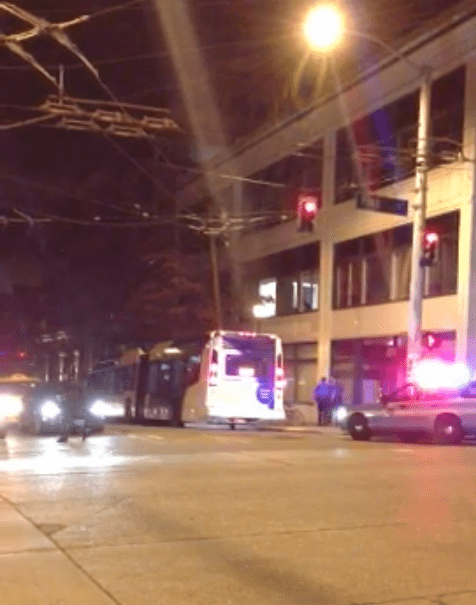 “If you see a readerboard that says ‘Call 911,’ you should try to note the bus number and call 911,” a Sound Transit spokesperson said. Hopefully, like Friday night on Pine, it will be nothing but an eye-catching false alarm. Could have been a bus that Metro was test-driving for its upcoming order of trolley buses. That’d explain why the driver was unfamiliar with the controls. slow night on the hill – excellent. Looks like a community transit bus to me… what they were doing on the Hill — their buses connect downtown Seattle with Snohomish county — I don’t know.